Curds are formed as part of the natural cheese-making process. 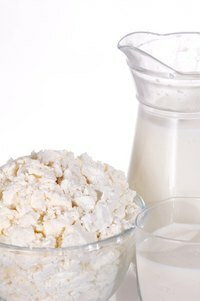 Because curds are not yet pressed into molds, as in the final cheese-making stages, they have more liquid whey in their structure. This structure is what gives its chewy texture and “squeaky” characteristics. After a few days, the liquid evaporates and the curds begin to dry and age. Freezing provides an economical means to extend your cheese supply. While frozen curds will lose the characteristic "squeak," they will not lose their flavor. Instead of eating them as you would fresh curds, consider using the defrosted curds for Wisconsin’s fried cheese snacks or Quebec’s Poutine dish. Split the curds into half-pound portions and place them on a cookie sheet in a single layer. Place the cookie sheet in the freezer for 20 to 30 minutes to flash freeze the cheese. Remove the cookie sheet from the freezer. Transfer portions to separate freezer bags or containers. If using vacuum-sealed bags, follow the manufacture's instructions to seal. Defrost frozen curds in the refrigerator until ready to use. They are best used within one to two weeks. Do not refreeze cheese after it is defrosted.